TRS consonants are listed in International Phonetic Alphabet (IPA) format below. The symbols used in practical orthography appear in parentheses. Conventional orthography of TRS is discussed in § 5 below. Consonants that are marked with an asterisk indicate variations in pronunciation (i.e., allophones) for some native speakers of TRS. /b/ is a voiced bilabial stop that may be pronounced as an approximant or fricative in intervocalic position and across word boundaries in words, for example [nːeː32 βeɾe̞n̪d̪eː3] ‘firewater’ from the Spanish word aguardiente. In all other environments (e.g., after a nasal or a pause), it is pronounced as a stop. /b/ may be a result of direct transfer from the Spanish grapheme b or v, for example burru2 [buruː3] burro (< SP [‘bu.ro]) or Betuj [bet̪u3h] < Beto short for Alberto in Spanish or baka [bakaː3] from Spanish vaca ‘cow’. /b/ in TRS may also result from the Spanish consonant f as in Belì [beliː1] from the Spanish name Felix. It may also result from voicing of Spanish grapheme p in word initial position, for example Balû [mbaluː43] < Pablo (< SP [‘pa.b͡lo]) or Berû [beʐuː43] < Pedro. It has been reported in the research literature (Longacre 1952:63) that there are some speakers who may pronounce b as partially voiced or voiceless when it occurs as the onset of a nonfinal syllable, as in besu [b̥e4suː3] < peso (< SP [‘pe.so]); however, there was a tendency for the consultants used in this and other related research to pronounce b as voiced as per analyses using PRAAT. [t̪ d̪] are voiceless and voiced denti-alveolar stops with long contact (Ladefoged & Maddieson 1996:22-23). Elliott et al. (2016) note that in some dialects of TRS, /t/ in word-initial position may be pronounced as /st/ in disyllabic words such as [t̪aneː3] ~ [s̪͡t̪aneː3] ‘goat’. /d/ in word-initial position may be pronounced with prenasalization, as in the TRS words [ndaweː2] ‘lake’ or [ndo3h] ‘more’. While /d/ is usually pronounced as a stop, it may be articulated as a fricative (e.g., [ð]) in intervocalic position or across word boundaries provided that the previous word ends in a vowel. Hollenbach (1977:36) has documented the fricative allophone of /d/ in TRC in intervocalic position in the onset of ultimas and in Spanish loanwords as well. DiCanio (2010:229), however, has documented only one native word in TRQ, [ru3ða3ʔ] ‘grinding stone leg’ that contains voiced interdental fricative; all other examples of [ð] are found in Spanish loanwords. /k ɡ/ are voiceless and voiced velar stops in TRS. Like the other voiced stops in TRS, /ɡ/ may be pronounced with prenasalization (e.g., [ŋɡ]) in word-initial position or after a pause, for example: [ŋɡat̪oː4] ‘shirt’, [ŋɡat̪oː2] ‘mold’ or [ŋɡat̪o2ʔ] ‘we will tell (him)’. /kw/ and /ɡw/ are voiceless and voiced bilabial-velar stops. Elliott et al. (2016) note that the pronunciation of /ɡw/ “on a continuum from careful speech (e.g., /ɡw/) to the vernacular or rapid speech” where it may be pronounced as [ɡw], [w] or [hw] as in güiì [wiː31] ‘people’ or nuguan’ [nuwã2ʔ] ‘word’ in the text below. TRS has two prenasalized stops [nd ŋɡ] as in [ndaː3] ‘until’ and [ŋɡaː3] ‘when’. In TRS, /n/ is often phonetically present but operates noncontrastively in words with b d and g in nonfinal syllables or after a pause and may be pronounced as [mb nd ŋɡ] as in [ndaweː2] ‘lake’ as in the text below. Previous research on TRS has shown that the prenasalization before b, d, and g is not a perceptually salient feature for native speakers of Chicahuaxtla whereas the nasalized segment in [nd ŋɡ] is. In addition, Elliott et al. (2012) reported that the prenasalized feature in [nd] and [ŋɡ] is approximately 50% longer in duration in comparison to prenasalization before /b d ɡ/. There are three voiceless affricates in TRS: denti-alveolar affricate /ts/; alveolo-palatal affricate /ʧ/, and retroflex affricate /tʂ/. There are several examples of affricates in the text, for example, [ɡat͡siː13] ‘white’, [ɡa–naʧ͡iː3] ‘PST–flow’, [ɡ–aʧ͡iː4] ‘PST–pass’, [sat͡ʃi3hi] ‘ancestor’, [nɯ2ʔ ɡa2t͡ʂa3ʔ] ‘everywhere’ and [t͡ʃũː3] ‘tree’. All native speakers of TRS have a minimum of two sibilants /s ʒ/. The graphemes s and y are normally pronounced as /s/ and /ʒ/, there are, however, some speakers for whom /s/ and /ʒ/ occur in free variation with /z/ and /ʒ/, respectively. For example, the TRS word for ‘serpent’ in the text below may be pronounced with complete voicing as in [ʒukwaː35], voiceless as in [ʃukwaː35] or with partial final voicing as in [ʃ̬₎ukwaː35]. In the research literature, rhotic r has been described as a voiced alveolar trill, however, recent research (Elliott et al. 2012, 2016) suggests that this sound can also be pronounced as a voiced retroflex sibilant and is transcribed as [ʐ] when it is pronounced in this way. This results in an additional fricative for some speakers of the language. Many younger consultants pronounce r consistently as a voiced alveolar trill as in Spanish, however, there are others for whom [r] and [ʐ] occur in free variation. The speaker of the text varies in his pronunciation of r in TRS. For example, the consultant first pronounces the TRS word ru’man ‘hole’ as a trill in [ruʔmãː3] then for the second occurrence, he subsequently pronounces it as [ʐuʔmãː3]. There are some native speakers of TRS who pronounce intervocalic r as voiced alveolar flap [ɾ] as in Berû [beɾuː43] < Pedro, others who may pronounce intervocalic /r/ as a voiced retroflex sibilant as in [beʐuː43] < Pedro, but all consultants pronounce r as a flap in the TRS words rè’ [ɾe1ʔ] ‘youSG’ and nej e rè’ [ne3he ɾe1ʔ] ‘youPL’, regardless of other variant pronunciations of /r/ they may have. (For additional information regarding the pronunciation of r, see Elliott et al. 2016). One of the more interesting phonological features of TRS is fortis-lenis consonant contrasts. Fortis-lenis consonant contrasts have also been reported for TRC (Hollenbach, 1977, 1984) and for TRQ (DiCanio, 2012). In addition, fortis-lenis contrasts have also been documented for Zapotec (Nellis & Hollenbach, 1980; Avelino, 2001; Leander, 2008), Amuzgo (Bauernschmidt, 1965) and Otomí (Bartholomew, 1960; Blight & Pike, 1976). Many of these studies have focused on a variety of phonetic correlates that distinguish fortis from lenis consonants, for example, duration of articulation, articulatory strength, tenseness of articulation, voicing versus voiceless distinctions, glottal width and the completeness of closure. (For more information on fortis-lenis distinctions in Triqui, see DiCanio 2012). According to Longacre (1952:63 fn 1), TRS has ten fortis consonants /p t k s ʃ mː nː jː wː lː/ and ten lenis consonants /b d ɡ z ʒ m n j w l/. TRS consonants /k ʧ r h ɾ/, are “undifferentiated as to fortis or lenis” (Longacre 1952:63 fn 1). In TRS fortis phonemes occur as the onset in monosyllables, for example, nnee [nːeː32]3> ‘water’ as in the text below. In addition, Longacre (1952:63 fn 1) states that “fortis consonants are distinguished from the corresponding lenis consonants by: 1) a perceptible lengthening of the fortis phonemes, especially with nasals and lateral /lː/; 2) by greater articulatory force and consistent voicelessness of the stops and sibilants of the fortis variety; and 3) by the consistent stop quality of /p t k/ as opposed to /b d ɡ/ which may have fricative and stop allophonic variation.” Consequently, the fortis-lenis consonants in TRS can refer to contrasts in: 1) consonant length, 2) voicing, or 3) strength of articulation. The distinguishing feature for fortis-lenis sonorant contrasts in TRS is duration. Fortis sonorants are longer than their lenis counterparts. The difference in duration in TRS is similar to the singleton-geminate distinctions as per DiCanio (2012) in his research on TRQ. 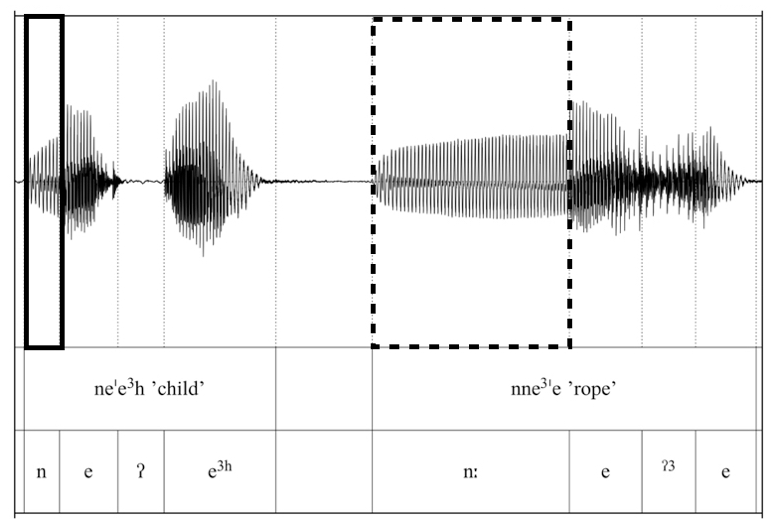 Figure 2 illustrates the lenis-fortis contrast comparing /n/ with /nː/ for this particular consultant with TRS words for [neʔe3h] ‘child’ and [nːe3ʔe] ‘rope’. The lenis consonant in [neʔe3h] ‘child’ has a duration of 59 ms while the fortis token /nː/ in [nːe3ʔe] ‘rope’ is 351 ms in length. For this particular comparison, the lenis token is approximately 83% shorter in duration in comparison to its fortis counterpart. Longacre (1952:63) notes that while fortis obstruents are voiceless, lenis obstruents in nonfinal syllables vary in terms of their degree of voicing and may be voiced, voiceless or semi-voiced. Analyses using PRAAT show that although varying degrees of voicing may be evident with lenis fricatives (e.g., [s] ~ [z] and [ʃ] ~ [ʒ]) , variation in voicing of obstruents [b d ɡ] in nonfinal syllables was not observed for the tokens collected for this and other related research. That is to say, [b d ɡ] were consistently pronounced as voiced consonants and frequently evidenced prenasalization resulting in [mb nd ŋɡ]. Elliott et al. (2016:3) note that prenasalization of voiced stops occurs in other Otomanguean languages such as Mazatec, Mixtec and Otomí. Finally, both fortis and lenis voiced palatal approximants (e.g., /jː/ and /j/), undergo nasalization before a nasal vowel, for example, hian’anh an or ñan’anh an [j̃ã2ʔã2hã] ‘God’ in the text below. Some native speakers write these words using ñ because they perceive its articulation to be similar to the voiced alveolo-palatal nasal /ɲ/ consonant in Spanish while others write it as hi (see § 5 below). 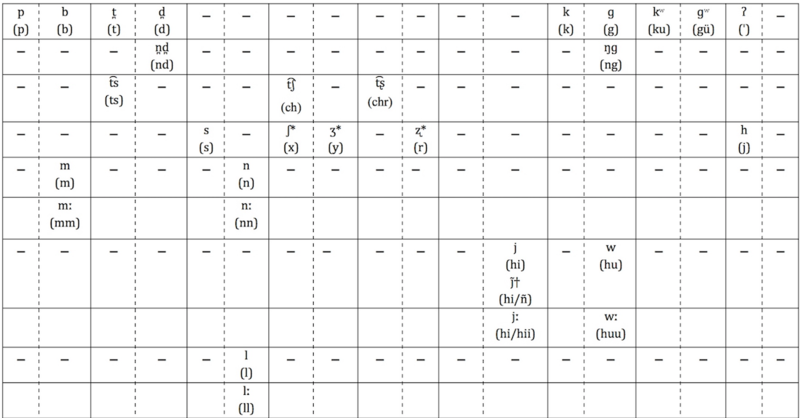 Table 3 lists examples of fortis-lenis consonant contrasts in TRS. TRS has two laryngeals: glottal stop /ʔ/ and /h/. There are no other word-final consonants that are lexically derived. Glottal stops occur only in final syllables, either as an onset or a coda consonant, for example, [ʔwːe3he] ‘thread’ or [so1ʔ] ‘he, his’. In TRS, the voiceless glottal stop may occur before a sonorant but not before an obstruent as in /ʔm ʔn ʔŋɡ ʔl ʔj ʔw/, for example, [ruʔmãː3] ‘hole’ and [ɡ–aʔmã3ʔ] ‘pst–heat up’ in the text below.